Each $67 box contains 24 packs. Each pack contains 9 cards. 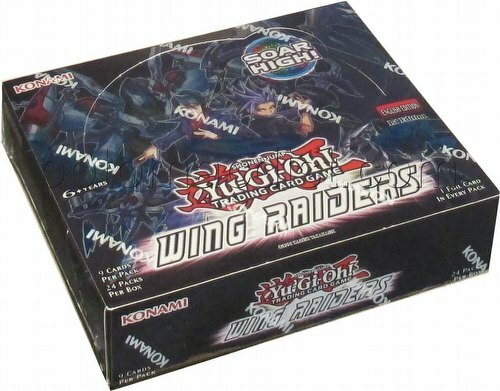 Yu-Gi-Oh Wing Raiders contains brand-new Xyz cards and cards from the new Yu-Gi-Oh! ARC-V series, including several cards to help players power up their current Deck, or build a whole new Deck! With the Wing Raiders set, Duelists can power up their Xyz strategies, like Raidraptors, with new powerful cards like Raidraptor - Satellite Cannon Falcon, an Xyz Monster that devastates your opponent's Spell & Trap cards and uses the power of fallen Raidraptors to sap the power of your opponent's monsters. Duelists can also try their hand at commanding two new monster themes that'll take their Xyz strategies to the next level - the spectral Phantom Knights and the Super Quantum mecha pilots. The Wing Raiders set contains 60 cards - 27 Commons, 12 Rares, 10 Super Rares, 6 Ultra Rares, and 5 Secret Rares.